So, you may be saying, how can M-Tech take any credit for a computer they have not invented and are not in existence yet? Oh, this is too easy. Think back to the Three Year TV show that syndicated into a modern day wonder we call Star Trek. Back then they had Tablets the they used for computing, today we have Tablet computers, they had flip open communicators, we had flip phones, they had Tri-corders, today we have, well stuff that does the same thing, I am sure there is a list out there showing all the things imagined by those writers that gave our science gurus the ideas that led to items we now take for granted. So by M-Tech throwing this idea out there, we are laying claim to a portion of the fame and glory sure to come. Wearable technology is all the rage today and is growing at a pace that will see over 30 million items of wearable technology sold, a 61% projected increase in sales. M-Tech Laptops, Inc. predicts this is a stop gap technology for the true wearable technology. Device that makes veins glow thru skin. Wearable technology is coming along as a market product so fast that it almost seems to leap frog over itself in the race for the next exciting idea. Well M-Tech Laptops wants to be the first (at least we have not heard of this idea before) to suggest that the next evolutionary leap in personal computing will be about as personal as it can get. How so? In a recent article published and shared across tech magazines a phenomenal breakthrough was announced. Individual cells have been turned into tiny lasers. "It's actually super-easy"Â says Matja Humar of Harvard Medical School. The feat allows cells to be labeled and monitored more accurately, which could boost our ability to track the spread of diseases such as cancer. The initial projected use for this technology is in the medical field. Imagine no longer having to blast Gamma light particles thru your cells to expose your internal structure on an X-Ray film. What if you could just inject the cells with harmless oil (we at least would hope its harmless) and have your cells project their image for the technician to see. They can monitor cell migration and progress much more easily. "Fantastic!Ã¢€Â we say. "Why stop there though" is our next comment. Instead of wearing bulky watches or less than stylish eyeglasses to check your email, surf the web or look up a wiki definition, why not scroll the palm of your hand or flip pages forward on your forearm. Now this is truly wearable technology. Personal computing cannot get much more personal than your own skin screen, at least not until we can implant holographic images in our retinas. Think of it, no items to actually wear drop or lose. Data transfers with another person could be as easy as a handshake. 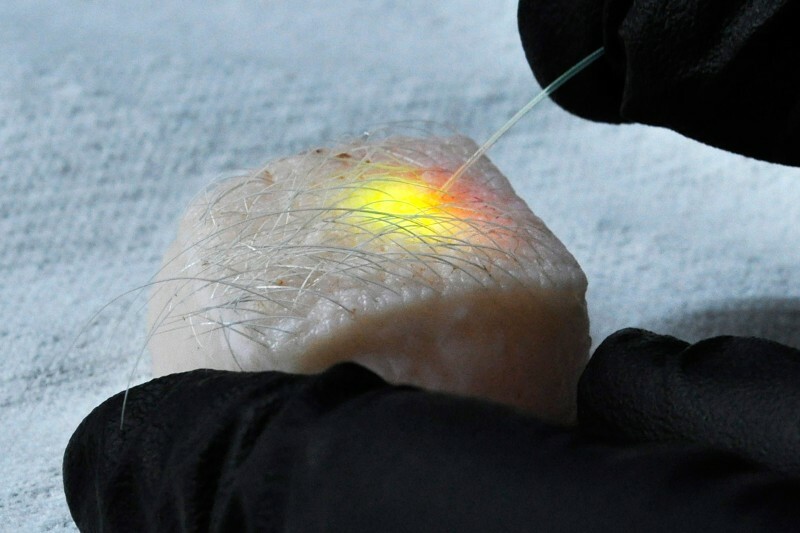 How would we get the skin imprinting lasers in our skin? My guess would be the same way we get tattoos. The oil substances that the cells react with must be injected into the cells. So the needle like device that injects ink could easily have us envisioning a device similar to that for injecting the oils. Depending on how much discomfort you can tolerate will determine what resolution you can have. This could start off a whole new way to judge people's characters. "Oh, I see you're a wimp, you could only stand to get 1024 X 768 skin res. Huh?Ã¢€Â Not a nice thing to imagine but every advancement has had its detractors, Nuclear energy also gave us the bomb, cars gave us drunk drivers, hammers gave us Maxwell and his silverÃ¢€Â¦, Okay, well you get the idea. Still, once you think about it, is there any doubt this is where personal computing and the Information technology will end up? Until we can have computers in our brain helping to imagine that we see the daily news in our minds, this will be something in our near futures the M-Tech Laptops hear bye predicts we will see happen. Of course, just as today we do today, M-Tech Laptops (in the future to be known as M-Tech Skintops) will have the highest quality and fastest skinputers in the world. You can count on it.